Inveneo recently co-launched the exciting announcement about its partnership in expanding ICT support in West Africa in order to fight and stop the spread of Ebola. Our team is proud to recently partner up with Cisco, Facebook, EveryLayer, NetHope, and the Paul G. Allen Family Foundation in order to provide sustainable Internet connectivity in medical centers in Liberia, Sierra Leone, and Guinea. These new Internet connections will enhance Internet connectivity for relief agencies, reorder supplies, and more. The Inveneo team will be working hard with our Inveneo Certified ICT Partners (ICIPs) in Sierra Leone and other parts of West Africa to ensure connectivity for those who need it most in Ebola-stricken communities. 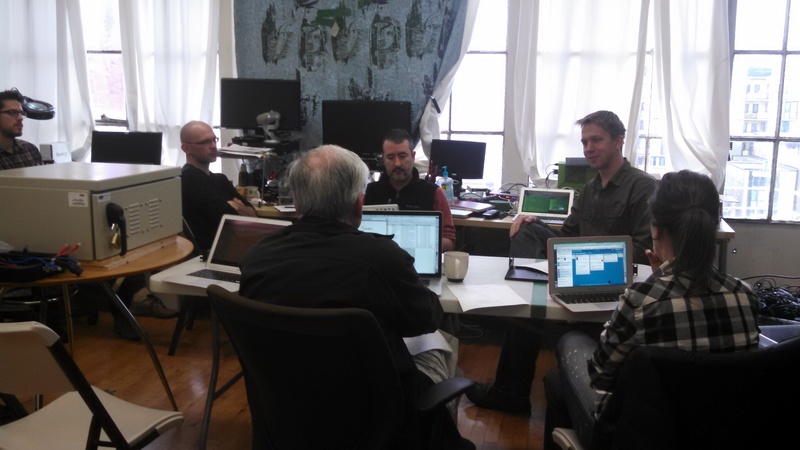 Members of a training session that Inveneo held in San Francisco. As a partner of the ERCI project, Inveneo recently hosted a training session for all current and incoming Inveneo contractors and engineers. Led by EveryLayer’s Andris Bjornson, the training session provided our engineers specific details on how EveryLayer designed the project’s broadband solution. According to our recent Press Release, our project “is based on a combination of extending satellite technology and strengthening existing service provider networks with carrier-grade Wi-Fi technology. The network can be deployed at a lower cost and on a faster time horizon than traditional mobile networks.” It is Inveneo’s job going forward to deploy this architectured solution and bring it to a full reality. We will be doing so while working alongside local partners as well to ensure that sustainable, low-cost Internet connectivity is available in relief agency offices and medical centers long after Inveneo staff leave West Africa. Going forward, Inveneo will have staff members or local partners continuously in Ghana and Sierra Leone. 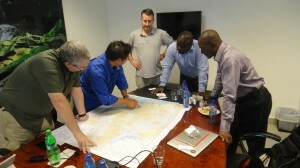 We recently deployed Senior Field Engineer Samuel Perales and Engineer Eric Kuhnke to Accra, Ghana to coordinate with staff of NetHope and other NGOs to plan next steps. They have been taking extensive preventative measures to ensure health and safety at all times. In addition, much of our equipment has been arriving in a warehouse in Accra, Ghana, and in Freetown, Sierra Leone, and our staff has been very busy organizing all the equipment. Our team is thrilled to work together with our partners and ICIPs throughout the ERCI project. We will keep you updating on how the project is progressing with posts, photos, interviews and more. Best of luck to our staff members and local partners – be safe and we look forward to watching the ERCI project unfold! “I came to Uganda to run the technical side of a mobile phone company. Instead, I was running the largest diesel fuel distribution company in the country—in order to run the mobile phone company,” says Francis Kazinduki, former CTO of MTN in Uganda. And he is not alone. This quote, taken from Dr. Laura Hosman and Dr. Laura Elizabeth Armey’s study on “The Centrality of Electricity for Internet Uptake in Low-Income Countries”, is a common sentiment among ICT professionals working in low-income countries. In their innovative study, Hosman and Armey analyze Internet usage growth in diverse locations from Mali to Haiti, and Sierra Leone to the Solomon Islands. What, they ask, is a key factor influencing ICT adoption across all of these low-income countries? Their answer: Access to electricity. Increased distribution of electricity across a nation is a key vanguard to ICT development success. Using dynamic panel data analysis, the two researchers based their findings on a unique data set taken from satellite images that capture the quantity and distribution of light that can be observed at night from outer space. This data set mediates variables such as defining what constitutes access to electricity and protects the study from faulty self-reported national electricity and energy data. While other researchers have used similar data sets for other purposes, this study is the first of its kind to use night-lights to measure real electricity use. 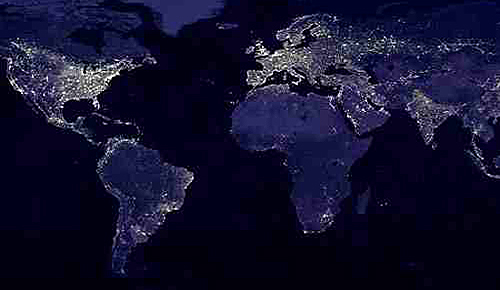 Hosman and Armey recommend pursuing policies that expand the distribution of electricity to greater numbers of people, not just increasing the total electrical output in each country, which tends to prioritize cities. The more people that have access to electricity, the greater demand will be for using the Internet and other related technologies. It is fruitless, they say, to discuss a digital divide where electricity does not exist. Many ICT projects have collapsed because they don’t fully realize the existing (or absent) electrical infrastructure within a country. 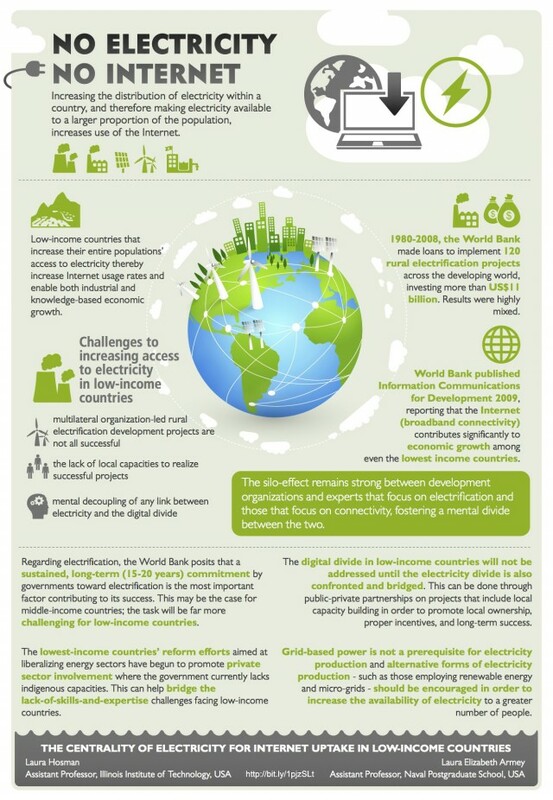 Addressing the electricity divide between high-income and low-income countries will not only spur industrial and knowledge-based economic growth, but will enable millions around the world to connect online. The key lesson to be learned? 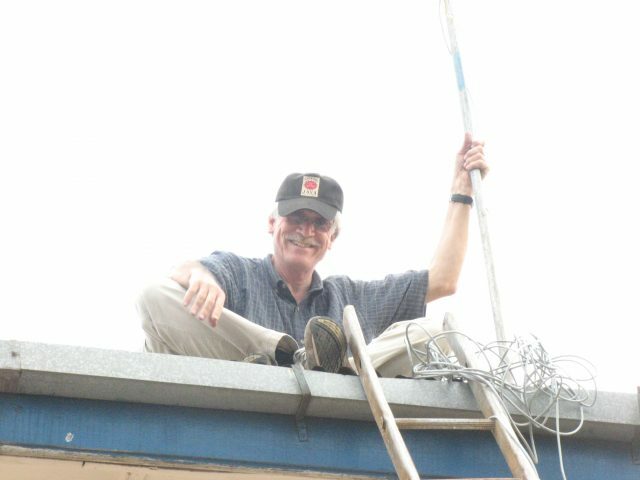 ICT development initiatives must first consider a location’s existing electrical infrastructure before setting up shop. The idea seems simple – it is just often overlooked. The infographic below is based off the study and was created by Bruce Baikie, Inveneo’s Executive Director. You can follow him on Twitter for more ICT updates at @BruceICT4D. This article was republished with permission from ICTworks.